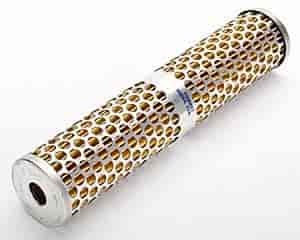 The Holley High Flow fuel filter features a tube-style design constructed of .150" wall aluminum tubing for maximum pressure capability and is anodized for appearance and protection against corrosion. The 10" long, 2.5" diameter case holds a very fine 7 micron paper element that is capable of filtering up to 750 gallons of fuel an hour. The removable end caps make servicing easy, are sealed with o-rings to insure leak-free performance and have female 1/2" NPT threads giving you plenty of plumbing options.